Join us this spring for a journey through the land of the Mayo as we explore the cultural traditions of southern Sonora with folk historian and naturalist Jesús García as our guide and interpreter. 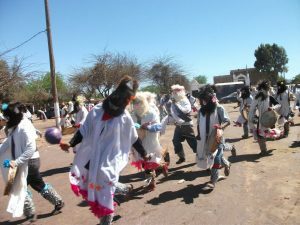 The Mayo (people from the shore) or as they call themselves, the Yoremem (the people who respect tradition), live in small villages and rancherías along the valleys of the Río Mayo and Río Fuerte in southern Sonora and northern Sinaloa, Mexico. The valley of the Río Mayo is a fertile agricultural region abutting the Gulf of California, where farming and fishing provide most of the employment. The Mayo are also talented craftspeople, weaving sashes and blankets, as well as baskets, and fashioning musical instruments and masks of cottonwood. Our first stop is Guaymas and the coastal resort of Playa de Cortes where our first day ends watching the sun set over the Gulf of California, enjoying an introduction to the traditional ballads (corridos) of the region. We begin day two with a visit to the only active pearl farm in the Western Hemisphere, Pearlas de Mar de Cortez, an opportunity to learn exactly how an oyster makes a pearl. Following a stop in Navajoa for lunch, it’s a short drive to the Mayo village of Júpare where celebrations for Ash Wednesday and the beginning of the Lenten season are underway. Like their cultural and linguistic relations the Yaqui (Yoemem), the Mayo combine traditional customs with the Roman Catholicism brought by the Spanish in the 17th century, resulting in religious ceremonies unique in the Southwest, celebrating sacred elements of both worlds. Beginning with a service on Ash Wednesday and then on the following six Fridays leading to Pasqua (Easter), select groups of men, led by the Maestros, begin to enact the Passion of Christ. Those representing Jesús and his disciples walk the Stations of the Cross, while a women’s group, including the three Marys, search for Jesús along the Way. All along, the evil armies of the Fariseos (Pharisees) threaten the church groups. This moving event provides a memorable glimpse into the culture and beliefs of other peoples and other times. We end our day back in Navajoa for dinner. In the morning we travel to the coast and the mangrove estuary of Yávaros for a float trip on the lookout for both shore and sea birds. Following a seafood lunch on the beach, we’ll spend time at a cultural fair with nearly every Sonoran indigenous group represented, selling crafts and samplings of their cuisine. Afterwards we’re on our way to the colonial town of Alamos in the foothills of the Sierra Madre, our base of operations for the next three days, the spectacular Hacienda de los Santos, one of the top small luxury hotels in Mexico. And how will be spend our time in Alamos? Birding the local “hot spots” in the region’s tropical deciduous forest; meeting local expats and touring a few of the more prominent haciendas under the auspices of Amigos de Educación, an organization assisting local students with scholarship funds; taking lessons in Agave 101, discovering the amazing and delicious uses of this versatile plant; and, immersing ourselves in a performance by the Estudiantina de Álamos, musicians who carry on the traditions of 11th and 12th century Spanish troubadours. And throughout the week, we will have sung or danced along with our private troubadour, Jesús García and his collection of instruments – guitar, accordion and Peruvian charango. We return to Tucson via San Carlos, enjoying a final evening beach soiree, watching the sun set on the Gulf of California. Combining the best elements of a cultural tour and a natural history voyage, this is an ed-venture not to be missed, and clearly not one you will soon forget. Hosted by South of the Border Tours in conjunction with the Arizona-Sonora Desert Museum, cost includes motorcoach transportation, accommodations, meals and guide services.